The Civil Rights History Project collection is a direct result of the 2009 Civil Rights History Project Act. 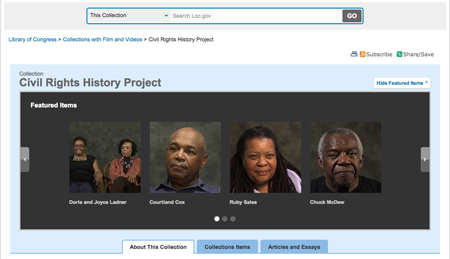 This law mandated the Library of Congress and the Smithsonian National Museum of African American History and Culture (NMAAHC) to conduct a survey of existing civil rights oral-history collections and enhance these collections by recording new interviews with people who contributed to the movement. This collection features new oral histories focused on the recollections of previously unsung, everyday heroes who witnessed and participated in movement events “to obtain justice, freedom and equality for African Americans”. The oral history videos are also accompanied by searchable, full-text transcriptions. The activists interviewed for this project belong to a wide range of occupations, including lawyers, judges, doctors, farmers, journalists, professors, and musicians, among others. The video recordings of their recollections cover a wide variety of topics within the civil rights movement, such as the influence of the labor movement, nonviolence and self-defense, religious faith, music, and the experiences of young activists. Actions and events discussed in the interviews include the March on Washington for Jobs and Freedom (1963), the Albany Movement (1961), the Freedom Rides (1961), the Selma to Montgomery Rights March (1965), the Orangeburg Massacre (1968), sit-ins, voter registration drives in the South, and the murder of fourteen year old Emmett Till in 1955, a horrific event that galvanized many young people into joining the freedom movement. Many interviewees were active in national organizations such as the National Association for the Advancement of Colored People (NAACP), the Congress of Racial Equality (CORE), and the Student Nonviolent Coordinating Committee (SNCC). Other interviewees were key members of specialized and local groups including the Medical Committee for Human Rights, the Deacons for Defense and Justice, the Cambridge (Maryland) Nonviolent Action Committee, and the Newark Community Union Project. Several interviews include men and women who were on the front lines of the struggle in places not well-known for their civil rights movement activity such as Oklahoma City, Oklahoma; Saint Augustine, Florida; and Bogalusa, Louisiana. Several of the interviews were conducted with the children of local civil rights leaders including Clara Luper, Robert Hicks, and Gayle Jenkins. Access the online portal to hear these moving stories and to connect with digital oral-history collections from around the country.